Sales were up in 5 of 11 subsectors, representing 69% of retail trade. After removing the effects of price changes, retail sales in volume terms were unchanged in October. Sales at motor vehicle and parts dealers (+1.3%) increased for the third month in a row. All store types within this subsector posted gains, led by higher sales at new car dealers (+1.1%) and, to a lesser extent, used car dealers (+4.1%). Following declines in August and September, higher receipts were recorded at gasoline stations (+1.9%) in October. In volume terms, sales increased 1.9%. Miscellaneous store retailers (+4.5%) reported higher sales in October, due in large part to the introduction of a new miscellaneous retail store type, cannabis stores. Excluding cannabis stores, receipts at miscellaneous store retailers increased 1.1%. Sales at cannabis stores totalled $43.0 million during the two week period following legalization. The availability of cannabis across the country was affected by differences in retail structures in each province and territory. Retail figures will vary as new stores continue to come on line and the marketplace continues to evolve. In the future, retail estimates for cannabis stores will be reflective of a complete reference month. At general merchandise stores (-1.8%), sales declined for the first time in three months. 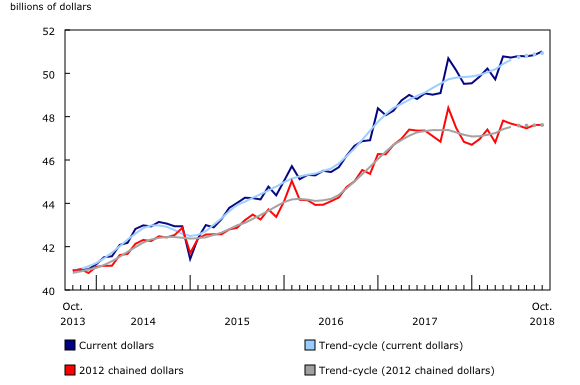 Retail sales continued their upward trend in Ontario (+1.1%), rising for the sixth consecutive month in October. The increase was largely attributable to higher sales at motor vehicle and parts dealers. Sales in the census metropolitan area of Toronto increased 1.8%. Sales in Quebec rose 0.8% in October from stronger sales at motor vehicle and parts dealers. Following two months of relatively flat sales, British Columbia recorded a 0.4% gain in October, on the strength of higher sales in the census metropolitan area of Vancouver (+1.1%). The gain was mainly attributable to higher sales at motor vehicle and parts dealers. In Alberta, retail sales were down 1.8%, marking a third consecutive decline. October's decrease was mainly due to lower sales at motor vehicle and parts dealers and general merchandise stores. On an unadjusted basis, retail e-commerce sales were $1.6 billion in October, accounting for 3.0% of total retail trade. On a year-over-year basis, retail e-commerce increased 19.3%, while total unadjusted retail sales rose 2.6%. As of October 17, the date of legalization, the monthly retail trade survey now collects and disseminates sales of licensed cannabis stores. This includes both in store and Internet based sales. Real-time tables 20-10-0054-01 and 20-10-0079-01 will be updated on January 7, 2019. Data on retail trade for November 2018 will be released on January 23, 2019.